Winnovative HTML to PDF Converter library for .NET can be integrated in any .NET application from ASP.NET and MVC web sites to Windows Forms and WPF applications. It allows you to convert in your application URLs, HTML strings and streams to a PDF document, to a bitmap images or to a SVG vector images. You can use the Winovative HTML to PDF Converter for .NET as a general purpose tool for converting web pages and HTML code to PDF and images or you can use it as part of our .NET Reporting Toolkit to easily create PDF reports directly from ASP.NET pages and to benefit from the great power of ASP.NET controls. The HTML to PDF converter library can be used to edit existing PDF documents, merge and split PDF documents, fill and save the PDF form in an existing PDF document. 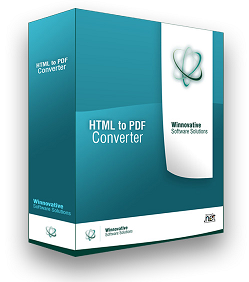 Winnovative HTML to PDF Converter comes with an impressive set of demo applications covering most of the software features. For each demo we provide the complete .NET source code in C# and VB.NET. Each feature is briefly documented inline in demo application and completely documented in product documentation. The evaluation versions of the development libraries we offer for download are fully functional and unlimited in time. The only difference between the evaluation version and the licensed version is that the evaluation version will insert a demo watermark in the documents it produces. Convenient and Flexible Licensing Model. Redistribution is Allowed. The Winnovative Software licensing model consists in two types of licenses: the Deployment License can be used in a single application that can be deployed on a single server owned by your company. The Redistributable License can be used in an unlimited number of applications that can be deployed on any number of servers. The Redistributable License can be distributed as part of your applications to your own customers without any additional costs.